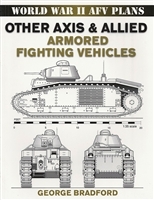 You'll find a selection of commercial tank and armored vehicle books here. And if you've got one of your own that you'd like to restore or keep running, be sure to check-out our Armor Technical Manuals (TMs) for everything you need. Excellent little reference on the development and deployment of the M10 and M36 tank destroyers Excellent little reference on the development and deployment of the M24 Chaffee Short and sweet history of the "Universal Carrier"
Sherman, History of the American Medium Tank by R.P. Hunnicutt. Volume six in the World War II AFV Plans series Amazingly comprehensive study of the most well-known U.S. tank of WWII Probably the best recent reference on the WW2 Sherman tank. Standard Guide to U.S. World War II Tanks & Artillery, by Konrad F. Schreier, Jr.